Our critically acclaimed game of dungeon delving, kill-stealing, and cooperative - backstabbing becomes even more challenging with the inclusion of a NEW game mechanic, an Event Deck that makes even the most familiar Encounters new again. And mixed among the Events are ways to earn powerful new Relics that confer game changing abilities upon their owners. 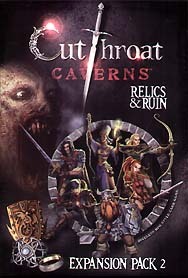 This is not a complete game you must own a copy of Cutthroat Caverns to play.